Welcome to the Jonas Brothers Wiki! Who the heck are the ''Jonas Brothers" anyway? The Jonas Brothers are an American pop-rock band from Wyckoff, New Jersey made up of three brothers: Kevin, Joe, and Nick Jonas. They have released two albums - "It's About Time" in 2006, and "Jonas Brothers" in 2007, and are dropping a new album called "A Little Bit Longer" this August. They also happen to hold the hearts of millions of teenage girls causing mayhem everywhere they go. What's new with the Jonas Wiki? July 22, 2008 - 8 more pages up and running! July 4, 2008 - Several new pages up including a "Fan Section" to check out the latest new media, images, and fanfiction are up! July 3, 2008 - Almost there! June 21, 2008 - Joe's page is up and running. Frankie, Kevin Sr, and Denise Jonas' pages are on the way! 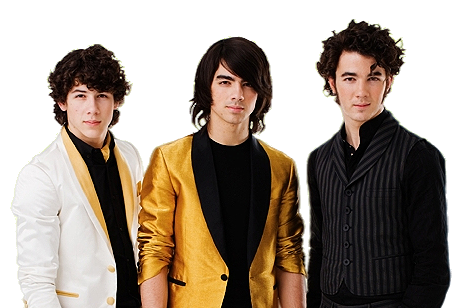 June 20, 2008 - Several pages are now available including Kevin, Nick, the main band's bio, all of the albums, and more. The main thing we need right now is contributors! Anyone can sign up to the site and start editing and adding new articles. So sign up and contribute what you can! This site is not affiliated with the Jonas Brothers, Disney, Hollywood or Columbia Records and the likes. This is a fansite that attempts to document the various aspects of the Jonas Brothers' career, etc in a clear, coherent fashion that is easily accessible. Many of the images on this site are the property of others and are only used here for the purpose of supporting and promoting the Jonas Brothers and their sponsors.